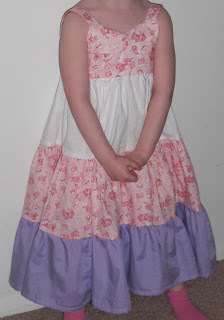 I completed my little girl's 3-tiered dress and it's too stinking cute. In fact it's so cute that after she tried it on she decided it was perfect for dress up. Instantly she changed into her alter ego of Melody complete with a even higher-pitched voice, a demanding attitude and her favorite pair of fancy dress up shoes. All in all I am very happy with the dress. It's not exactly like the inspiration but it didn't have to be. It is much too fluffy to be worn on a daily basis as she might trip walking up or down the stairs. It's very full and very long. It ended up hitting her lower calf when finished.